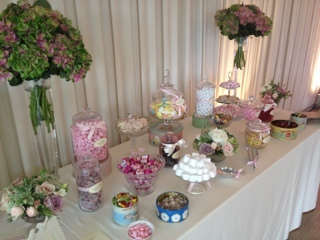 Candy buffets and dessert tables are still one of the most popular new trends for 2012 weddings as they add loads of nostalgic fun to the occasion for guests as well as looking, smelling and tasting fantastic. 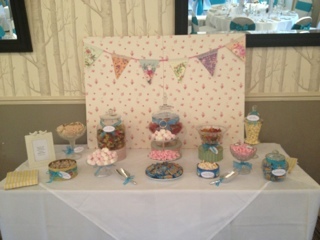 Local company Bristol Candy Buffet has had numerous wedding bookings this summer and is expecting 2013 to be even busier. Recent bride Tracy, had a vintage inspired teal candy buffet for her wedding and was delighted with it. She sent a glowing testimonial to the company, recommending their services to other brides. 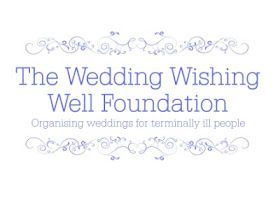 "Thank you for the excellent display that you did for our wedding on the 8th June. The sweets went down a treat and at times there was quite a queue!!! Luckily me and Stu got to taste a few. I would have no hesitation in recommending your services. I wish you all the best for the future and thanks again. " If like Tracy you would like to add some stylish fun to your big day, visit the Bristol Candy Buffet website to learn more about the packages and view the gallery of gorgeous sweeties. These candies look lovely. A fresh and fun way to celebrate weddings. Hats off to Bristol Candy Buffet for this great idea. It is true that old fashioned sweets are included in the menu on all sorts of celebrations and the meals cannot be considered complete without adding sweets and chocolaty flavors.